One of the first thing we did even before my daughter was born was to make our place baby safe…As the bug grew up we laid off a little on “safety” as I thought as she grew older, she would know what things she needs to get away from …At least I thought so until the other day she came out of our bathroom with a bottle of Tylenol for kids and told me she needed medicine…It then hit me that kids do not always stay away from the things they are not supposed to get into. I think all parents know that, its just to what degree or level you can rely on your kids to know better. I thought we were doing a good job, as we do not leave any medicine lying around and we keep them in our bathroom. The reality is that we can’t expect kids to know not to touch medicine as a matter of fact. You can’t even expect teenagers to know better than to stay away from some medicine. The Medicine Safe is a good-looking, ergonomically designed safe with steel reinforced composite body construction engineered to keep prescriptions and over the counter medications organized and secure. 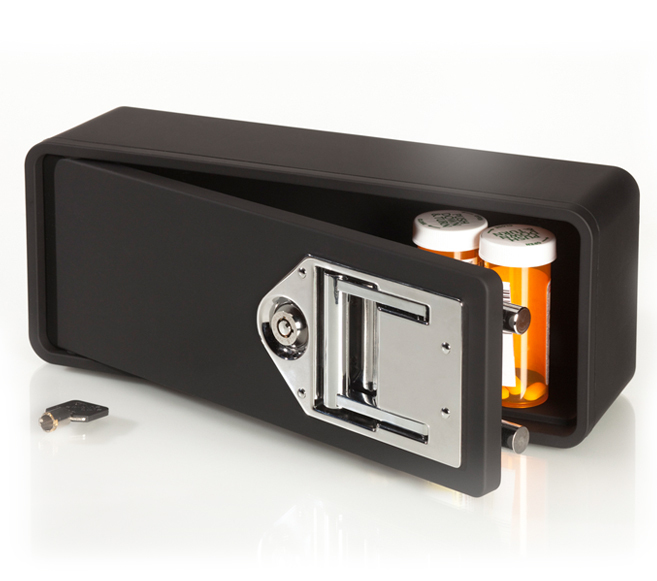 Accommodating prescription bottles of up to 4” tall, the Medicine Safe keeps medicine secure with its patent pending locking mechanism that deploys two steel “double throw” locking bolts. When I was offered the opportunity to try the safe, I was immediately interested to see if this could be an option to keep prescription medicine secure and away from my little girl! The safe accommodates about 7 standard size medicine bottles, and it is very sturdy, it has a steel reinforced composite body construction and this safe can be securely mounted inside a medicine cabinet, (all you need to mount your unit is included with the safe). Mounting it is optional as it fits perfectly inside the medicine cabinet. The safe has a “handle “that acts as the lock mechanism as it unlocks when you pull the handle. To keep it locked, it comes with two serialized barrel keys. A great product and a must have in all homes with kids, teenagers and elderly people. 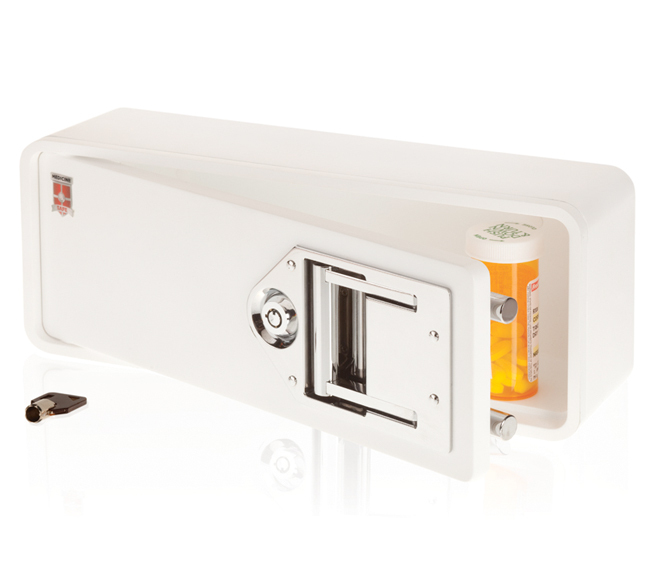 The safe has a retail price of 69.99 and it is available in ivory or black. Medicine Safe has kindly offered one lucky Born 2 Impress reader, the chance to win a free Medicine safe! Please use the Giveaway Tools form for ALL entries. Blog comments will not be counted. « Check the Verilux 10 Winners Facebook Contest! You can bolt it to the wall. It fits about any where. Great for having young Grandkids. You can register your safe immediately online, so that if you lose the key, they can quickly send you a new one for $9.95. I can fit inside the medicine cabinet or vanity drawer. I love that the safe has a key.I would hope not to loose it but I guess its better than trying to remember a few numbers. I learned that persons 12 and older who use pain-relieving drugs nonmedically obtain them primarily through a friend or relative. I learned that it is small enough that it will fit inside my medicine cabinet. I learned that is made of steal so it would be hard for my kids to try to get into! What I LEARNED: I love that it dual entry systems..combination and a lock! It can be bolted to a wall or inside the medicine cabitnet! How neat! I learned that it weighs 3.35 pounds. Thanks! I learned that it weighs 3.35 pounds. It weighs 3.35 pounds. Exterior dimensions are 12” x 3 3/8” x 4.75”. Can be mounted by using any combination of 6 prepositioned mounting points. I like that it can be securely mounted inside a medicine cabinet. I learned that it only weights Weight: 3.35 lbs. For me that means if I go overnight somewhere it is not a heavy thing I could not put in a suitcase. I am not sure though if allowed to use for travel as I assume they would have to look through it at security? I do take several medications a day, plus supplements so I’d be interested in knowing. I have been thinking about a product like this for the past year since we have a 16 month grand daughter lives with us since her birth…we need to be more safety savvy for sure. out of practice. I learned that the Medicine Safe rests perfectly inside a standard medicine cabinet. I learned that it will fit in my medicine cabinet. I learned it is made of steel. They offer replacement keys for $9.95 if you loose yours. I learned how much it weighs! I learned that if you happen to lose your key you can order replacement keys for $9.95! I learned that you can have replacement keys shipped to you for $9.95 using the serial number on your cabinet and knowing the model #. I’m not sure it’s big enough…what if you have bigger bottles? Sometimes the pharmacy gives you a lot at once (I think it’s a billing thing). It would make me feel safer about our meds. ..
:This entry uses confirmation. You will not be able to submit this entry until you have performed the action above.”. I just wondered if it doesnt do an auto confirm, if the entries still count. Thanks! It can fit in a cabinet and or be bolted to the wall. Thanks for the opportunity! Our patent-pending locking mechanism and steel reinforced body provides security and easily fits inside your medicine cabinet or vanity drawer. I learned your able to get a key replacement. I learned: You can register your safe immediately online, so that if you lose the key, they can quickly send you a new one for $9.95. I learned that it will fit in most Vanity Drawers. Replacement keys are $9.95 each. I learned that the key is replaceable if lost. I could put it in my vanity! I learned it can be bolted into place and you can easily get a new key. I learned that you can get a replacement key if you lose your originals (as long as you register the product). I learned it weighs 3.35 pounds and can fit right inside your medicine cabinet. I learned you can purchase replacement keys for $9.95 each. You can bolt it to the wall which means you can put it anywhere you choose, like on a closet wall. It has a key to keep everything safe! Thanks for the giveaway…one year Limited Warranty !